Remember the lousy movie “Mars Needs Women,” the 1967 cult classic in which Tommy Kirk leads his fellow Martians to Earth on an interplanetary quest for females? Well, Michigan has the women (though maybe not so many in their child-bearing years). The state really needs babies – and the women who want to have them. While there have been periodic upticks over the last 21 years, the general trend has been one of steady decrease. The recently released total for 2011 births in Michigan represents a drop of 25.4 percent since the halcyon days of 1990. Nothing, of course, compares to the baby boom period. In 1960, as the baby boom years were nearing a close, Michigan residents recorded 195,056 births. For more perspective, the 2011 total represents a level of births last seen in the mid-1940s. Delving a little deeper into the numbers, we need to understand the trends by age of mother. A very positive trend has been the decreasing rates of teen mothers. Over the period 2000-2011, the number of births to women age 15-19 years has decreased by 31.5 percent. While a numerical decrease is important, the fact that the birth rate for teenagers (number of births per 1,000) has also dropped by 31 percent over this period is even better news. Moving up the age ladder, we know that increasing levels of educational attainment have resulted in delayed childbearing for women. This is reflected in Michigan with percentage decreases ranging from 13 percent to 19 percent for each of the four 5-year age cohorts between 20 and 39 years of age. When we look at their birth rates, we find that only the 20-24 and 25-29 cohorts experienced a decrease, -21.1 and -3.6 percent, respectively. Birth rates increased for those 30-34 and 35-3, 4.7 percent and 9.6 percent, respectively. While women between 40 and 49 years of age account for a relatively small share of overall births, that number has more than doubled since 1990. In addition, their birth rate over this time has more than doubled, as well. Using this information to predict our future, we can look at population forecasts developed by Don Grimes from the University of Michigan. The number of women between 20 and 34 years of age, the major contributors to births in Michigan, is projected to stay rather steady between now and 2020, at which time they will begin to decrease. Unless there is a renewed interest in having babies, and this might mean more than one or two at that, their contribution will not change appreciably. In fact, there is a likelihood that their birth rates will continue to decrease. Women 35 to 44 years of age will decrease in number through 2020 when they begin to benefit from the aging of the previous cohorts. Therefore, since they contribute a relatively low number of overall births, a continuation of their increasing birth rate will have little, if any, effect on the bottom line. While the discussion to this point has been at the state level, it is interesting to see how these trends play out at county level across the state. 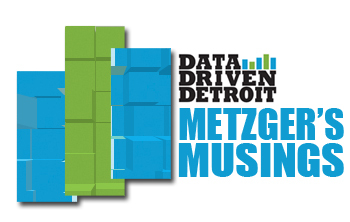 Data Driven Detroit (D3) has produced a map that portrays the change in births between the two-year periods of 2000-01 and 2010-11. Only four of 83 counties experienced an increase in births between these periods – and three of them are in the Upper Peninsula! While this is certainly good news, the older age distribution that is resident throughout the U.P. and mainly northern Lower Peninsula counties, with the exception of those with universities, is still resulting in “negative natural increase,” as births outnumber deaths. The largest percentage decreases tended to be concentrated in the northern Lower Peninsula, while the largest numerical decreases occurred throughout Southeast Michigan. Wayne County experienced a decrease of 6,839 annual births, primarily as a result of a continued decrease in Detroit. In spite of Detroit’s birth rate decline, it was still higher than any county in the state. Its birth rate fell by 10.5 percent over the period. The largest birth rate decrease among the southeast Michigan counties was experienced by Livingston at -25.2 percent. Oakland followed at -17.0 percent, while Genesee and Macomb came in around -15 percent. While their total births may be dropping, West Michigan counties hold the majority of the top spots for overall birth rates. Among the 83 counties, Kent is no. 1, St. Joseph no. 2, Ottawa no. 5, Oceana no. 6, Muskegon no. 7, Van Buren no. 8 and Berrien no. 9. It is obvious from the trend in births, and the relatively stable to slightly increasing death and immigration numbers, that domestic migration will continue to be the key – unless Michigan develops policies that foster the desire to reproduce! Outlawing abortion would be a good start. More babies would be born and could be adopted by waiting families. Everyone wins. Everybody wins except the mother who doesn't want to go through the pregnancy. Oh and the child suffers from the irresponsible behaviors the mother continues to make because she is being forced to go through with the pregnancy. I forgot to mention, schools and taxpayers have to delve out more money for special education programs for these children who were born addicted to drugs, alcohol, and have low birth weight and overall poor health because their birth mothers didn't care about their baby. They didn't want it in the first place. So I guess nobody wins except for the parents who get to adopt the unwanted unhealthy baby. How about trying to keep our young people here by creating more job opportunities. We whine about not supporting higher education enough and giving alot of advantage to out of state students. When these graduates leave for low unemployment areas or head home with an exceptional education gained here in Michigan, we wonder why they are leaving our state and not starting families here. If you create a first class welfare system, you will get more participants. If you pay for welfare babies, you get more welfare babies. We need to break the cycle and encourage a workfare system that builds self esteem and reintroduce the selfsatisfaction of having a job. For too long Michigan has relied on GM, Ford, Chrysler, American Motors and the rest to be the revenue sources for big social programs. These once mighty giants have been brought to their knees and can no longer be the financier for Michigan's welfare program. The age of big government has got to end or Michigan will become just another welfare state. How did I automatically know "MC Persiko" was male? Who can afford to have a baby in this state? There are no jobs that pay anything without an advanced degree, and if you're busy borrowing an insane amount of money to get through college to get that degree, who has the time or the wherewithal to have a baby? It is not merely a question of "building self-esteem" and re-introducing the "self-satisfaction" of having a job, it's having an education base that teaches marketable job skills in an internet age, it's having community resources, such as child care, medical coverage, and public transportation, that make it possible to seek out and hold a job and parent children as well. Much of Michigan lives beyond a the digital divide, and Gov Granholm's plan to network the state with high-speed fiber optic cable fizzled to nothing. I posed this situation to my nieces who are in their 20s and their take was: Young women are busy carving out identities and lives for themselves and are not interested in tying themselves down with children. Some are more attracted to the liberality of the east or west coasts than boring Michigan with it's "religiosity" and "small-mindedness" (or as one said, "Michigan is great for a vacation week, but live there??") And most people of their generation are convinced there are already too many people in the world. If the need for babies is a truly an issue for Michigan, what about opening the door to welcome immigrants as was done in the past? When our social engineers get smart enough to limit student loans to majors that are in demand rather than latin culture G & L history & under water basket weaving, then we'll start producing graduates that are in demand. Even the teaching schools keep grinding out the same old, same old. Where's the research and inovation that is needed to address todays children, not the 60's kids? Either we come up with new technology & techniques to reach the students we have or we accept that the lack of family support is just too big to over come and accept failure. Its not the American way to say we have a problem and we can't deal with it. We have made phenominal break throughs in every field, why not education. Are we too complacent or just lazy? There has to be a solution out there somewhere, it is just going to some dedication to making a difference for it to evolve. Mrs. A, You make a very good point. It a fact that a big percentage of divorices are because of finances. I know what I went through 50 years ago and our young people are going through the same thing now. Having a home today is out of reach of so many of our young people. My youngest son is going through the same as I did when I was young. This is a problem for our country not just Michigan but it is worse here than in a lot of other states as our standard of living has been so good in the past but now is unaffordable for those who want a family.